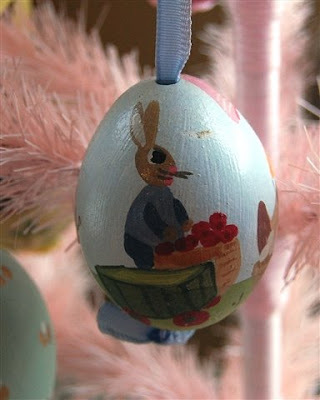 Nothing Cricut or Design Studio related today...but I thought you might enjoy seeing my Easter Egg tree and some of the eggs I collected when we lived in Germany. We lived outside of Stuttgart for nearly three years and I really enjoyed our time there. 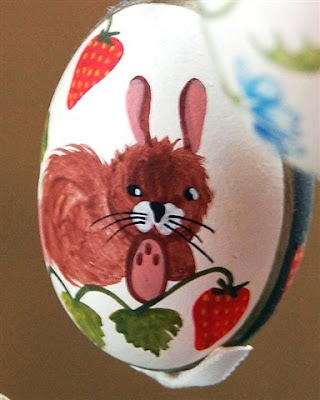 Many local artists would paint elaborate designs on eggs. 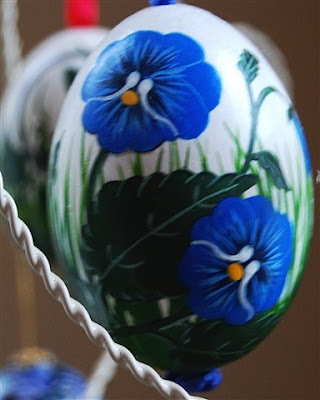 This floral egg was painted by a friend from my "English Morning Tea" group. The eggs were sold in shops and local craft markets. The designs were limited only by the imagination of the artists. Designs with, bunnies, chicks and flowers were very typical. This bunny was also painted by my friend. When we moved to England, and then back to the US, I was always worried that my eggs would not survive, but they were fine packed in egg cartons with lots of extra bubble wrap and paper in boxes marked "fragile." 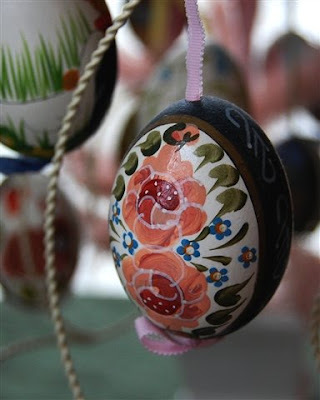 These are just a few of the painted eggs - I have some others from Poland and the Czech Republic with different types of decoration - some have fine straw glued to them in symmetrical patterns and are dyed with deep colors. Another set is done with fine ink lines in a blue and white "Delft" type pattern (similar to the "blue onion" china design). 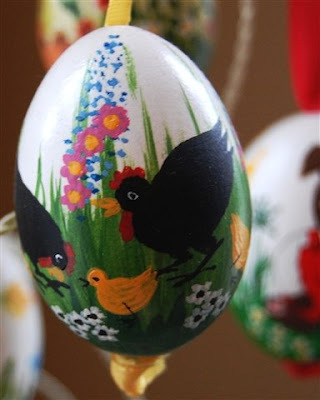 In Germany, these decorated eggs were often displayed on an actual tree branch, either in a vase or suspended from the ceiling with wires. I put some of mine on this wire "Christmas" tree and a little pink feather tree. Some of the others just go in bowls for display. I hope you enjoyed seeing these. I will try to have a new Design Studio file to share tomorrow. These are beautiful!!! And it's wonderful that you've been able to keep these wonderful keepsakes through the years!!! Thank you for sharing them with us! Oh my goodness! Your egg collection is absolutely stunning! Thanks so much for sharing them! Happy Easter! I just love that egg tree! 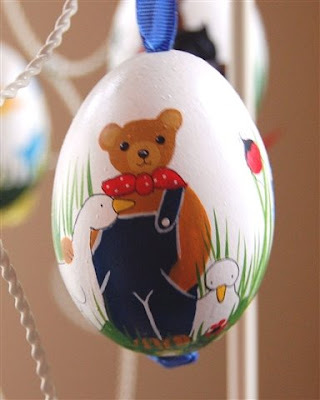 I collect decorative eggs frim hand painted to crystal ones! The eggs are beautiful. 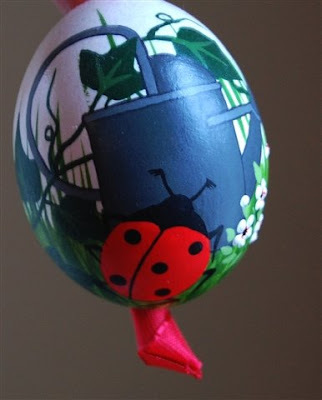 I have a few that are painted by a friend many years ago and I always put them out at Easter in a bowl. Thanks for sharing yours. Hope your day was wonderful. We enjoyed ours with two of our Grandchildren who live near. These are so beautiful. I love your wire tree that you display them on. I need to look around and find one. Where did you get it? 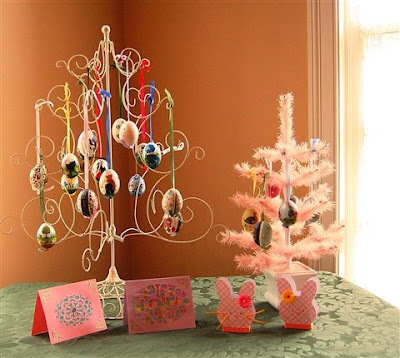 Diane: I love your Easter cards and eggs on the tree, just beautiful. Do you know where you got the tree and if i can order one online cuz we wouldn't have anything here like it. The wire tree was a gift from my brother a number of years ago. It was actually a Christmas tree but I thought it would work for other holidays as well. I think it came from Pottery Barn but I doubt that they still carry it. You might find something similar at Pier 1 or another store with lots of decorative items. 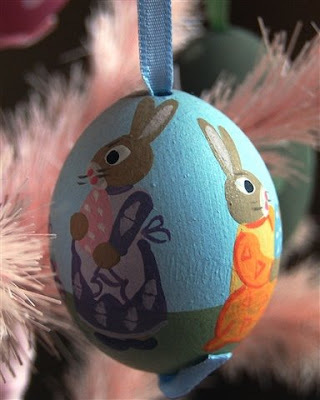 I lived in Germany near Munich and observed an Easter tradition that was "Wunderbar"
On Palm Sunday, people would bring their home made Easter trees, some as big as 5' to the church to be blessed. They then stuck the trees in front of their homes, to bring good luck. 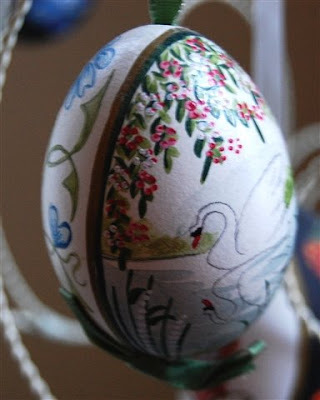 They were very natural, even thought some were using plastic eggs that they had decorated. The tree was also decorated with greens, flowers and blooms from trees. Some smaller ones were put into flower pots in front of the door, seen on this German book cover. Would be nice if we had this tradition here. I have been blowing out eggs for the last week or so to decorate! I love the looks fo eggs in a bowl or just laying around! How are the eggs prreserved once they are blown out? Are they cleaned with anything? When you use the egg emptier to get the eggs out of the shell you can then fill the pump with water and rinse out the inside of the egg. Do a search for "egg blower kit" and you will find some options - mine is called "Blas-Fix" and comes from Germany (but is sold at stores in the US).